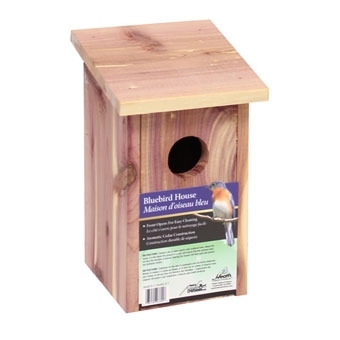 This Heath Mfg® Bluebird house features a side tilt opening for inspection and cleaning purposes. It has a 1 ½” enterance hole. Simply mount the house 5-6 feet above the ground on a pole, and ensure that the enterance does not face the direction of winds or storms. Spacing the houses 200 feet apart will help prevent any territorial conflict between birds. Made in the USA by Amish Craftsman. 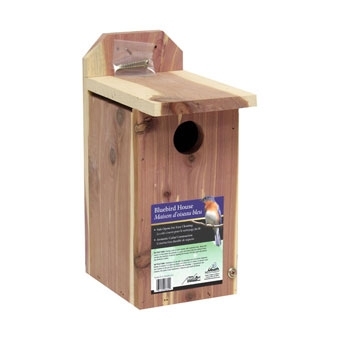 This Heath Mfg® Bluebird House is their most popular model! It is constructed of Heavy-Duty Cedar for Superior Weather Resistance and now has an easy front opening to make cleaning much easier. It has a 1 ½” opening for birds to enter. Simply mount the house 5-6 feet above the ground on a pole, and ensure that the enterance hole does not face the direction of winds or storms. Also, spacing houses 200 feet apart will help prevent territorial conflict between birds.